Your home is a place of gathering, meeting and connecting. It is where the solid foundations of life are built. Home is your haven, the place that keeps welcoming you back day after day. Hunter Douglas NewStyle Hybrid Shutters belong there. The perfect combination of real wood and alternative materials, custom crafted just for you. They've brought together the elements that create lasting beauty and are a reflection of the place you call home. Crafted and designed to your precise specifications and covered by the Hunter Douglas Limited Lifetime Guarantee. A hybrid material, fashioned using the beauty of real wood combined with advanced man-made elements provides a quality product with superior strength, straightness and stability. Our low-luster Finetech finish enhances the beauty of NewStyle Shutters. The character is soft, warm and beautiful. A natural in any room, this finish gives the impression of a fine wood shutter. Lead times are dramatically shorter than industry standards. Installation from Hunter Douglas trained shutter installers ensures a quality, professional measure and installation. We recently helped a customer in Southlake who had stopped by our Hunter Douglas Gallery. She knew she wanted shutters in her new family room and kitchen because these rooms face west. We showed her Hunter Douglas NewStyle shutters and she loved the quality and feel of the shutter as well as the ease of cleaning. They are at a great price point too! We then made an appointment for an in home consultation and measure. 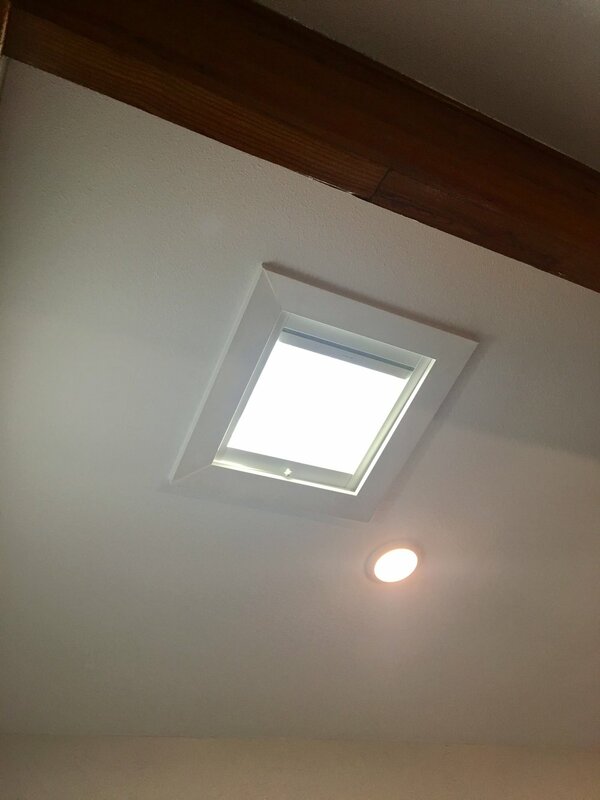 We suggested that we use the 4 1/2" louver size because of how it opens up the room to the outside. We used the Bright White color because of the perfect match to the window sills. The shutters were installed a few weeks later and they not only looked beautiful, they also helped with the client's energy efficiency, solar heat control and UV protection. The Hunter Douglas NewStyle Shutters were a perfect solution for these rooms. A few weeks later we were back adding shutters in her Master Bedroom and Bath. The Master Bath was my favorite. I love this look! For this client in Frisco, Texas we installed Hunter Douglas NewStyle Shutters throughout her new Shaddock Home. These shutters are custom crafted for each window. We used the standard Z frame and they all looked beautiful. Our client was happy with the high quality standards and the feeling of comfort that the home now has. We used 4 1/2" louvers to eccentuate the large windows and give the most view through to the outside. We added a divider rail so the bottom portion and top portion can operate independently providing privacy when needed and maximum light control up top. The front tilt rods gave the traditional shutter look that the client loved and makes her new house feel like home. We proudly serve Richardson, Grapevine, Prosper, Celina, Dallas, Highland Park, Colleyville, Coppell, Denton, Arlington, Flower Mound, McKinney, Allen, Mabank, Rockwall, Rowlett, Trophy Club, Westlake, Southlake, Carrollton, Robson Ranch, Light Farms, North Dallas, Addison, Farmers Branch, Lewisville, Plano, Frisco, Little Elm, Park Cities, Fort Worth, Northlake and everywhere in between! Welcome Spring! Now more than any other time of the year, we open up our homes and let the fresh air in. And nowadays we are adding to and enjoying the outdoor living space more than ever. So there is a real need for functional solutions for covering the patio doors. Whether you have a Sliding Glass Door or French doors, here at Read Design Plano and Read Design Southlake, we have plenty of ideas and solutions to help you. After we have solved your indoor needs we can also move outdoors and help you cover your patio with Corradi Outdoor Screen Shades. You need to think about whether you do get direct sun through these areas or not and also about the glare, energy loss, and destructive UV rays. But you also might have a beautiful view to keep in mind. Consider Sheer Shadings from Hunter Douglas. These include Silhouettes, Pirouettes, and Luminettes. These shade will offer you the view while maintaining all the solutions for light and energy control . Sliding Glass doors are gaining popularity in the Dallas/Fort Worth area and today there are many more options than just the old fashioned Vertical Blinds. One of our favorite Vertical solutions is the Luminette Privacy Sheer. The rotating vanes offer you a large range of privacy and light control and the soft fabrics bring beautiful elements of design to your home. A characteristic of all Hunter Douglas Soft Shades is the ability to enjoy your view while shielding your home from glare and harmful UV rays. There are many other ideas from Hunter Douglas for these areas. These include the gorgeous Provenance Woven Wood Shades. We recently added Provenance Woven Shades to this home is Coppell where the client did not need much privacy or sun-control because the doors were protected by the balcony above. We used a shade with a rich texture and white color to blend with the doors and it was the perfect solution. It allowed the client to see her kids play in the yard while providing some privacy. The low profile head rail and the hold down brackets make this shade an ideal candidate for your patio door window coverings. Vignette Modern Roman Shades and Design Studio Roman Shades are also great solutions for covering French Doors. With many fabrics to choose from and with a range of colors and textures, we are certain to help you find the perfect fabric for your style. When pulled up, the soft folds of these shades make a beautiful valance. In this homein Frisco, TX we used a textured Grassland fabric in the Vignette Modern Roman Shades product line. When in the down position, the fabric folds beautifully and maintains that look when pulled up. We added Drapery panels to frame the doors and make a picture to back yard. Don’t forget about Plantation Shutters - these classic window coverings never go out of style. Especially when using a larger louver size, you can really get a great view. When closed, or even when the louvers are slightly opened in the up position, Plantation shutters can really protect your furniture and floors from harmful UV rays. Give us a call at either location. Our Designers would love to show you these ideas, or many others. Stop by either Gallery to see over 70 working samples. You can see, operate and select the perfect lift system for your home including the new PowerView Motorization. Let us help you put a plan together that will solve the issues you have with these doors and any window in your home. We can also help you with Custom Draperies and Curtains and all kinds of Top Treatments. Now is the time to let the outdoors in and enjoy the weather with effective solution for your Patio Doors. Also ask us about our Corradi Outdoor Screen Shades for your outdoor Patio. Read Design will help you with ideas for Patio Doors in these areas: Dallas, Highland Park, Park Cities, Plano, Prosper, Frisco, Allen, McKinney, Richardson, Wylie, Murphy, Parker, Rockwall, Carrollton, Lewisville, Grapevine, Southlake, Kellar, Trophy Club, Arlington, Flower Mound, Denton, Celina, Little Elm,. Bishop Arts District, North Richland Hills, Robson Ranch and everywhere in between. Dallas, Fort Worth and surrounding cities – the New Year is upon us! If you’re thinking about window coverings for your new or current home, today is a great day to start looking. 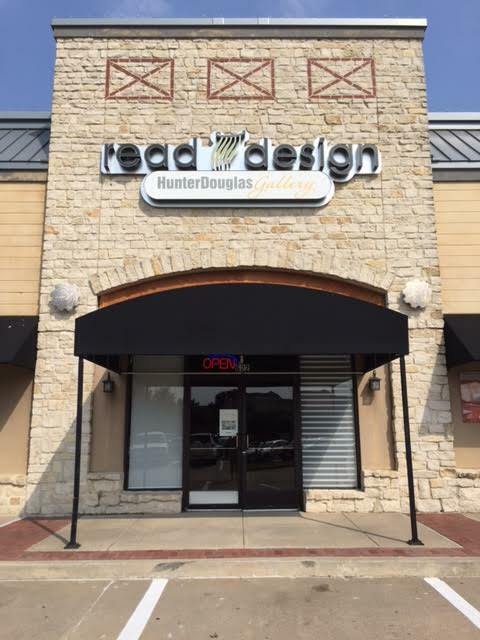 Read Design in Plano & Read Design in Southlake are Hunter Douglas Galleries and are the area’s leader in window treatments, window treatment automation, custom draperies, awnings and exterior shades. Stop by either of our Gallery locations to see over 60 functional window covering displays including the latest in Window Coverings Automation Technology Systems. Our professional designers are committed to bringing your the latest styles, current design trends and innovative technologies to best suit your needs. For more expert information on window treatments or for a free in store consultation call Plano at 972.608.4999 or Southlake at 817.416.7164. When you stop in the showroom be sure to ask for a free Art Of Window Dressing book. We have great in-store promotions as well as Hunter Douglas rebates on Luminettes, Silhouettes, Pirouettes, Vignettes and Duettes. Natural light constantly changes and shifts through the day - as does what we expect from our windows. We want full sun one moment, low light the next, a clear view, then a discreet screen. Our sheers, shades, blinds and shutters help you balance the light you want with the privacy you need. At Hunter Douglas, privacy and light are interrelated. Our designs, in a wide array of materials, colors, and opacities let you control light effectively and customize your privacy throughout the day. And their sheers and other select styles are specially designed to diffuse and draw light deeper into a room helping to illuminate your home naturally. Sunlight is warm and welcoming, but without ultraviolet (UV) protections over time it can fade and damage a room’s furniture, floor and décor. Hunter Douglas products offer ultraviolet protection to help counter these harmful effects. Privacy with softened light. Enjoy subdued light and the privacy of soft draperies on Luminette Privacy Sheers. Fabric vanes rotate for privacy while controlling the light in a room. Perfect for large windows and sliding glass doors, their superior UV protection meets both your decorating and practical needs. We recently installed Luminette Privacy Sheers in a home in the Preston Hollow area of North Dallas. This room is the customer‘s sitting room and study combination. The windows are on the front of her home so she definatly needed privacy but she also loves light. The Luminette was a perfect solution for her 3 windows. The Radiant White Fabric looks beautiful against here soft gray walls. The whole look lends itself to a transitional style which is exactly what this customer wanted. And because her furniture is positioned in front of the windows , we added the PowerView operational system with the PowerView App. This works beautifully especially in the later afternoon when the sure starts to come in those windows. She has her Luminette's set on a schedule so they open and close at preset times during the day - she never has to lift a finger! Style gets Smarter with Powerview Motorization. With the introduction of PowerView Motorization, Hunter Douglas is leading the revolution in intelligent home design with the smart window treatments that can adapt to every moment of your day, and make each more beautiful. PowerView is a new wireless system that lets you control the window treatments thoughtout your home from your smart phone, tablet, Pebble Remote or Pebble Scene Controller. Better yet, use the PowerView App to schedule personalized Scenes to operate automatically in response to your unique light, privacy and comfort needs as they change throughout the day. Set your mind at ease with the Remote Connect Feature that allows you to view and operate your shades from across the world. When you combine the advanced technology of PowerView with the unrivaled selection of sophisticated styles, fabrics, and colors, you will find the most beautiful window treatments are now also the most intelligent. Your window treatments will become such an essential part of the way you live, you will wonder how you ever lived without them. By the way, our customer selected the Poppy Red colored Pebble. Read Design has been a Window Fashions leader in the Dallas - Fort Worth area for over 25 years. Stop in today at either of our locations, Read Design Plano or Read Design Southlake, to see over 60 working samples. You can touch, feel, and play with the PowerView Pebble remote. Or you can call either of our Mobile showrooms and we will bring the store to you. The designers at Read Design are committed to bringing you the lastest trends and styles. Read Design are helping customers with Hunter Doulas productsincluding Luminette Privacy Sheersand PowerView Motoriztion all over the Dallas / Fort Worth Area includingDallas, Highland Park , Park Cities, Preston Hollow, Richardson, Allen, McKinney, Wylie, Parker, Plano, Frisco, Prosper, Celina, Little Elm, Carrollton, Lewisville, Flower Mound, Grapevine, Southlake, Keller, Trophy Club , Argyle, Arlington, Fort Worth and all areas in between.